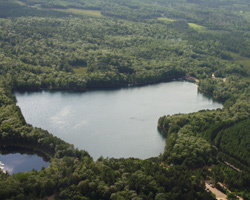 The Crystal Lake Scout Reservation (CLSR) near Rhinelander, Wisconsin, consists of three camps which provide year-round programs to Scouts of all ages: Akela's World, for Cub Scouts & Webelos; Tesomas Scout Camp, a Boy Scout summer camp; and Hanna Venture Base for Boy Scouts & Venturers. The CLSR occupies most of the land around Crystal Lake, a spring-fed lake with many species of freshwater fish. The CLSR is operated by Samoset Council of the Boy Scouts of America and was established in 1999. Opening in 1993, Akela’s World Cub Scout Camp provides opportunities for Cub Scout & Webelos to experience camping and the great outdoors. Akela’s World creates exactly that; another "world" by allowing its unique theme to take complete control of the experience. The programs allow challenge, creativity, adventure, and learning. We provide many advancement opportunities that take advantage of our beautiful outdoor setting. Learn More about Akela's World! The most notable portion of the CLSR is Camp Tesomas, which has developed into a camp of regional and national fame, due to its popular summer camp program. Boy Scout Troops from across the nation have camped at Tesomas. Founded in 1935, it currently serves over 3,000 campers per summer. Learn More about Tesomas! Hanna Venture Base opened in 2000 as a place for Boy Scouts and Venture to experience high adventure. The facility features an indoor climbing wall and an outdoor 60’ climbing tower, with walls for rappelling and climbing. Week-long Hanna Venture Base Treks are taken by both Scouts and Venturers. Trek destinations include the Apostle Islands and the Porcupine Mountains. The base was named after, and financially supported by Al Hanna, whose achievements include climbing Mount Everest.